For forty-one years, Bert Sanders has been promoting and volunteering at sporting and outdoor events in the Peoria area. An enthusiastic individual in the community, he has been foremost at the front in many aspects of area sporting events. Bert has actively been a hands-on person. Peoria Journal Star sports writer, Jack Ehresman said, "With the help of Bert, Don Wolland and the Isaac Walton Legion, they started what was called National Hunting and Fishing Days." This involved thirty-two outdoor clubs. Bert and Don served for 3 years (1971-1974) as co-chairmen of the event. From 1965 to 1975 Bert was a shooting exhibitor in the field of archery. During that period, he was heavily involved as an instructor for teenagers at many area high schools. He also served as archery club secretary. In 1984, he became race director for the Peoria Motorcycle Club of the TT Races. After 28 seasons, he still holds that position. This event has produced an unbelievable amount of revenue for the community. 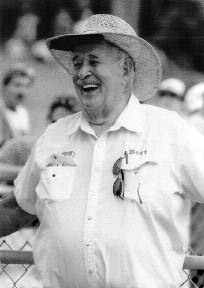 In 1993, Bert was awarded Dirt Track Promoter of the Year by the Motorcycle Association. Continuously tied to racing throughout the year, he has volunteered for obstacle races and poker runs. He's often called upon by others for his expertise when it comes to anything with events associated to the Peoria motorcycle track. He was on the committee which created the Grand National Weekend. Presently, he's in the process of expanding this to a 3-day event. For his contributions, Bert was named Grand Marshal of the event in 2005. In 1994, he became a member of the Peoria Area Sports Commission. Since that time, he has been the most active volunteer for the organization. Bert has spent countless hours at March Madness, the state cross country meet, state girls softball and boys baseball tournaments, Steamboat Days and other sporting events sponsored by the Peoria Convention and Visitors Bureau. In 2005, he received the PCVB "Steve Kouri MVP Award" for promoting and volunteering at March Madness. His lifetime of service is greatly appreciated. Ron Maestri covered all the bases in forging out an outstanding baseball coaching and college administrative career. A native of Highland Park, Maestri entered coaching immediately after his baseball player days at Bradley were over, serving as assistant coach at Princeville, Spalding and Pekin before returning to Bradley in 1967 as a three-sport assistant. In 1972 he became head baseball coach at New Orleans University and in 14 seasons went 518-247-1. His teams finished second in the 1974 Division II NCAA College World Series and his 1984 team was fifth in the Division I College World Series. He was Region 11 Coach of the Year in ‘84. He won the Sun Belt Conference in 1978 and 1979 and he was Sun Belt Coach of the Year in 1979. His teams won seven Division I regionals between 1977 and 1985. He was also athletic director at New Orleans 1979 - 2000 when he retired. He is a member of the New Orleans Hall of Fame, the American Baseball Coaches Hall of Fame, the University of New Orleans Hall of Fame, the Louisiana Italian-American Hall of Fame, the Bradley Hall of Fame and the Louisiana Hall of Fame. As an administrator, he was executive director of the 2000 New Orleans Bowl, the 2002 NCAA women’s volleyball Final Four, the 2003 NCAA Men’s Final Four and the 2004 NCAA Women’s Final Four. 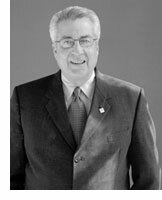 He also has been chairman and co-chairman of many other major collegiate and other sporting events in New Orleans.